On a recent trawl through early nineteenth century newspapers in the National Library, I found this fascinating item on the inhabitants of the townland of Gortrummagh and Fakeeragh in 1836. This rather interesting letter to the editor of the Galway Patriot, signed only with the initials J.H., was written on 19th May 1836, simply to draw attention to the great age attained by many of the author’s neighbours. The letter lists the names and ages of several people in the townlands and in many cases gives their relationship to each other. To anyone with ancestors of the same name coming from this district, the information given here is invaluable. It is doubtful that any other record for this group of people exists. The majority of the people listed would have been the occupiers of smallholdings living on the D’Arcy estate, and no record of tenant leases for smallholdings from this early period seem to have survived for this estate. Almost certainly they were all Roman Catholic, but the church records for this parish only start in 1838 and were not complete in the early years, so there is little hope of finding them listed there. There is no point in checking the local graveyard either, as it was not customary to inscribe names on headstones at the time; the graves were simply marked by placing a stone at the head and foot of the grave. And so we find that a simple letter to a newspaper editor, written by a man with a curiosity for people’s ages, an interest in mathematics and an obvious love for his locality, can perhaps, 175 years later, take some amateur genealogist back yet another generation in their family tree. “Perhaps the following curious circumstances may be found worth a place in your very valuable Journal. This day, at the funeral of a good old neighbour, an extraordinary instance of longevity arrested my attention. In the village of Gurtdroma, (that in which I drew my first breath, and the residence for more than two centuries past of my maternal ancestors,) there are now living in good health, eight persons, whose united ages make 697 years; their names are – John Prendergast, father of Mrs Lynch, of Salt-hill, Galway, 90 years; his wife Mary, 84; Patt Gaven, 85; Patt Cloonan, 85; Patt Keady, 81; Bridget McGrath, 99; Margaret Molloy, 87; Sibby Clisham, 86; and if to these we add the ages of Francis Lynch, Esq., of Omey, and Mrs Elizabeth Lynch (who till very lately lived within one mile of this place, and are now not far removed from it), the former 97 years and the latter 80, we shall then have 10 persons, whose joint ages make 874 years. I pray here to be permitted to observe that Francis Lynch never drank strong liquors. It is a fact, not less striking, that there have lived on that limited tract, until within a recent period laid up with their fathers, fifteen persons, whose ages put together would make 1406 years, viz. : – My great grandfather, Edward Joyce, 110 years; he never tasted ardent spirits, never complained of ill health, and never had his sight impaired to his death; his son, Martin, 81; Martin’s mother-in-law, Mary King, 88; his sister Ellen, 63; her husband, Ulick Joyce, 98 – five persons in one family whose ages number 460 years; Michael Flaherty, 97; Margaret, his wife, 92; her mother, Kate, 105; Judy Keady, 102 (mother-in-law of the above named John Prendergast); James D’Arcy (husband of the above named Margaret Molley) 101; Matthias Clisham (husband of the above Sibby) 93; James Madden, 88; John Delap, 84; his wife, Margaret Pole, 89; and Patt Burke, father of James Burke, Esq., attorney, (who, a little before his death, which happened in December last, removed to Omey,) 95. In collecting the above information, I have this day had the statements of five of these persons, besides other most authentic testimony. The purity, salubrity, and healthfulness of the air of this place have long been celebrated – to which, as well as the contiguity of the sea-bathing, many persons have attributed this unusual longevity. It may not be out of place here to observe that there are several springs of spa and mineral waters, (one of which John Prendergast and his family still drink of) to be found on this little region of long life. 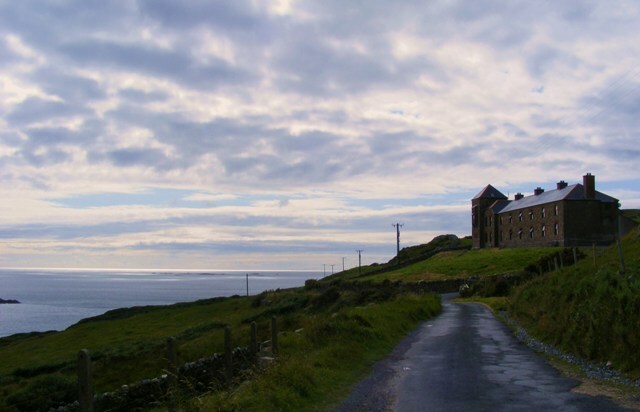 This sweet interesting little village is situated within half a mile of Clifden castle, the delightful seat of Mr. D’Arcy, and not quite two miles from the town of Clifden. It is situated on a rising ground, and overhangs Ardbear Bay, one of the most beautiful formed by the Atlantic. The prospect from the hill above it extends on the South East to Arran and the co. Clare, 60 or 70 miles distant; on the South to the Brandon Hills, in Kerry, 90 miles; to the south-west and westward, as far as the boundless horizon permits the eye to reach. This view is, in fair weather, diversified with the sight of the various sized shipping, and, in rough weather, by a most tremendous breach of sea over the shoals of Slinehead. To the north-west, the view extends as far as Achill Head, and all the intermediate islands, 70 miles; to the northward, as far as the Reek, or Crough Patrick, near Westport, 40 miles; on the east, the hills of Joyce Country and Bunnobola interrupt the view, but ample compensate for this defect by their stupendous height and magnificent romantic appearance, about 20 miles distant. Taking it altogether, perhaps the united kingdom does not furnish so extended a prospect. I have been led into this digression to show, that besides being healthful the situation is exceeding pleasant. What a shame that the letter writer did not give his full name.